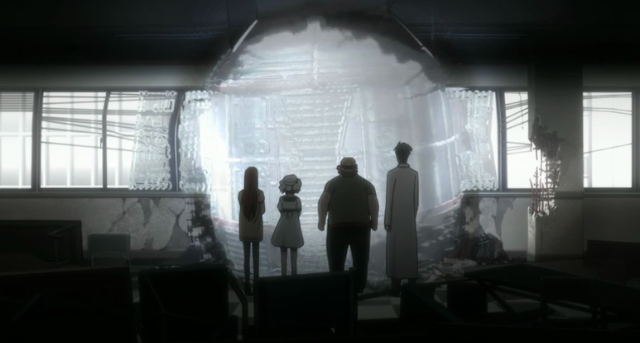 Episode 16 of Steins;Gate was full enough of twists that I don’t really want to say too much. Suffice it to say that John Titor travelled to the past twice in this episode, and at great cost. It was an oddly emotional episode, with enough surprises to be quite entertaining, but by no means have the Future Gadget Lab members resolved the most important problems facing them. In particular they have yet to reach 1% divergence. Even if they didn’t reach the one percent divergence point they wished to meet, it’s all good. A lot of things happened in this episode and it was a good summation of the reasons why I love this show. Suzuha has a doomed fate, much like Mayuri, except that this particular fate of hers isn’t subject to change. It’s absolute, once she’s gone…she’s gone. That may well be. It was pretty impressive that they could go over as much as they did in one episode. Still kind of sad how things worked out for Suzuha. What’s worse is that this still didn’t bring them closer to getting the IBN1337 or whatever. Suzuha’s life was basically wasted – why didn’t Rintarou send a D-Mail back to the past telling her not to go? I don’t want to believe that. I’m just going to believe that they don’t fully know how to fix it yet. After all, if she put the computer at the shrine, and Moeka stole it with the D-mail she sent, they still have to undo letting Moeka in on everything. It wasn’t wasted per se, but it would be effectively wasted if this were in real life. However, since this is Steins;Gate, every single episode moves the plot forward a bit more – Suzuha couldn’t have done all that and had the plot stay the same.